This year, FFDN is presenting three different programs, two at Sony Centre for the Performing Arts and one at Ryerson Theatre. Each program showcases four different companies and mix of Canadian and International artists. Each also has at least one performance danced to live music. And did I mention, tickets are only $15?! I saw Program 1. The evening began with Adizokan by Toronto based Red Sky Performance. The piece has a lot going on. There is a blend of contemporary and traditional Indigenous dance. There is live music by the Toronto Symphony Youth Orchestra along with an electronic score, live singers and a beat boxer. In addition to the movement happening on stage, a constant stream of images is projected on the screen at the back. My eyes sometimes didn’t know where to focus, and I felt a little overwhelmed by all the stimulation. But the combined effect was mesmerizing and beautiful. Montreal’s Compagnie Marie Chouinard was up next. Wow! I thought these dancers were incredibly talented and versatile. Radical Vitality, Solos, and Duets is a series of short excerpts from previous works which showed a wide range of styles. Each vignette was grounded in contemporary dance and had an element of humour that had the audience laughing out loud. Next was La Tribulación De Anaximandro (Hombre, Arche, Apeiron) (excerpt) by Los Hijos Del Director from Cuba. Set to a bass-heavy, repetitive, throbbing score, the piece featured three men and five women forming and reforming patterns as they moved across the stage. It made me think of a kaleidoscope. The movement was sometimes violent and clashing, and it never stopped. By the end, my heart was pounding from the driving beat, and I felt sympathetic exhaustion for the dancers. The evening closed with Seven by Soweto Skeleton Movers, a high-energy crew of four dancers from South Africa. 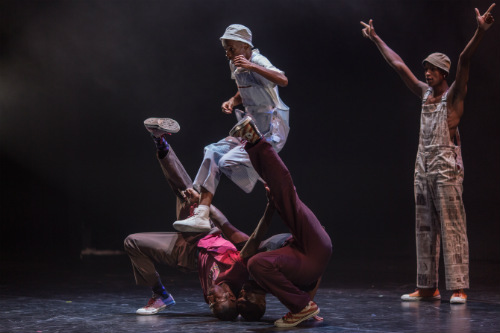 The movement is a form of street dance called pantsula, which originated in the black townships during the Apartheid era. There is popping, acrobatics, fancy footwork, and contortionism. These guys were seriously double -jointed. It’s fun, light-hearted, and a great way to end the show. I’m really glad Fall For Dance North exists. For the price of a movie, you get a smorgasbord of incredible and incredibly diverse dance. Go try it. Even if you don’t love everything you see, you’re bound to find something intriguing. Fall For Dance North runs from October 2 – 6, 2018 at Sony Centre for The Performing Arts (1 Front Street E) and Ryerson Theatre (350 Victoria Street). Shows are 7:30pm with a matinee at 2pm on Sunday. There are 3 different programs. See website for details. All tickets are $15 and can be purchased online. Festival passes are also available for $45.